The lowest point in the valley is 11,000ft and many villages lie as high as 14,000ft. Though rich in space – a shade less than one square kilometer to every citizen- Spiti is poor in cultivatable land. 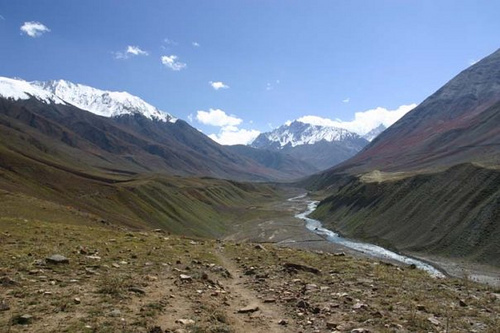 Over the centuries, man and yak have endeavored to scratch out less than one thousand hectares in isolated patches on the flats above the silver Spiti River. There is plenty of water in the rivers below and the glaciers above, but the searing flats are as dry as the valleys of the moon. There is no rain in summer as the mountains exclude the valley from most of the monsoon rains. Only when the force of the monsoon is very great do the clouds get driven as far as Spiti and some heavy showers fall but the rainfall is invariably insufficient to have any beneficial effect on the growth of crops or grass. The winter snow soon evaporates once the summer sun begins to scorch the valley. With almost no rain but abundant snow-fall, Spiti is a land of fascinating contrasts – shocks of green alternating in a barren expanse of russet. The dry harsh climate, high altitude, lack of communications and the poverty of the land, all cumulatively, make life hard in the extreme. The searing heat in the sun, the extreme cold in the shade and the freezing temperature during the night turn sand particles into micro fine dust of countless hues whirling and floating in air on the slightest agitation. A sub-division of Lahaul & Spiti District, Himachal Pradesh state, with Tibet as its next door neighbor and ethno-religious cousins, Spiti is strategically located in the trans-Himalayan niche. The country is surrounded by enormous mountain ranges and traversed by th main line of the Himalayas. The drainage of the northern river Tsarab runs into the Indus while that of the main Spiti river joins the Sutlej. The average elevation of the mountain ranges is over 18,000ft and they lie somewhat higher than Lahaul. The valleys are some two thousand feet higher than the Chandra and Bhaga valleys of Lahaul and the lowest parts of Spiti valley are considerably more than 11,000ft above the sea.